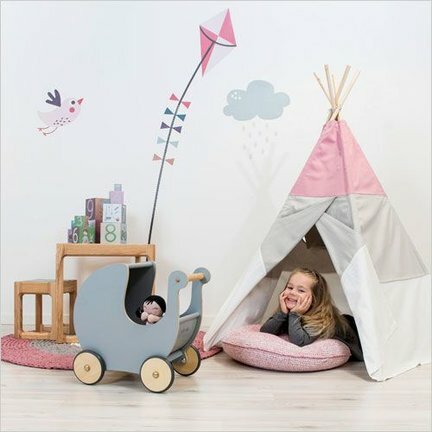 Decorate your Scandinavian children's room with famous brands like Done by Deer, Sebra, Fabelab and Ferm Living. Rugs, wallpaper, posters, lighting, everything for a cool children's room in Scandinavian style. Is your child ready for a children's room? Or are you going to give the children's room a new look? Please have a look at our extensive range of children's room decoration. We have the nicest Scandinavian brands for you in our shop. Major well-known brands such as Done by Deer, Fabelab and Sebra, but also small labels such as That's Mine and OMM Design. We have nice rugs for the children's room, lamps, wallpaper, posters, toys and also tableware to nicely eat together at the table. With Scandinavian children's brands, you always buy safe children's stuff, which also has that amazing typical Scandinavian look. With us you always get personal service. We will be happy to help you if you have any questions about the decoration of your children's room or the children's range in our shop. Just send us an e-mail or call Annelies (0031-6-47780005) from Monday to Friday between 09:00 and 17:00 hrs.